If you follow us on Twitter then you may already have seen the beautiful painting below by Roz Hall, of fellow artist Benjamin Rabe, but we wanted to mention it here as it really stopped us in our tracks. When you look at the brush strokes, colour, light and shade in this portrait it is hard to believe it was painted on an iPad, but it was! It just makes you say "Wow!". Roz used Procreate (second time we've mentioned that app in as many days) and a healthy dose of talent to create this image, we are sure you'll love it too. Be sure to check out the rest of Roz Hall's artwork on his Flickr stream. Every day there are plenty of images being added to the iPad Creative Flickr Group. We wish we had the time to show them all to you, even keeping up with the new images is a challenge for us, but we are going to try really hard to let you know about more of them in future with these short posts. 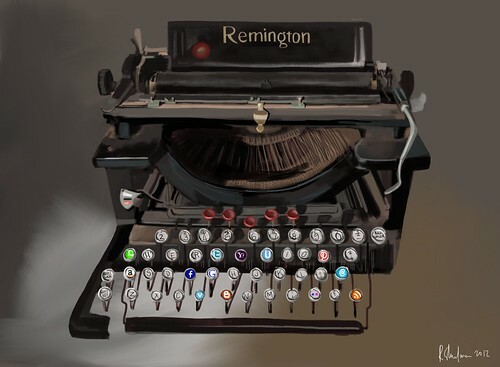 This one from iPad Junkie (aka Rick Shulman) caught our eye today because of the clever old school/new school social media idea and also great detail. Rick painted this image on his iPad with the excellent Procreate app. Feel free to leave us a quick comment below and tell us what you think. You'll recall how impressed with were with Thank Each Mistake by Maniac, being the first fully animated music video produced entirely on the iPad, and a wonderful piece of art in its own right, Thank Each Mistake was a landmark event. A year later and nothing has quite matched its fun and flair, but the video for Art Decade's Western Sunrise comes awfully close! As far as we can tell from the making of video, Procreate was used to storyboard the video and then to turn each frame of the computer animation into something a lot more impressionistic. Clearly this isn't an iPad only production, but the iPad did play a vital role in the final look and feel. Procreate is one of our favourite apps, if you haven't tried it yet, today would be a good time to start as Savage Interactive have announced the Procreate (in)famous competition. Grand Prize. First prize will win a 32GB iPad 2 or a $600 gift card to spend with Apple. 2nd Prize. iTunes giftcard to the value of $100. Contest Instructions. Sketch, paint and create someone famous OR infamous using Procreate for iPad! It can be an iconic public figure who’s inspirational to you, someone who gets in the headlines for all the wrong reasons, or a character from a movie or TV show that’s a just a plain nightmare! You can submit 3 (in)famous iconic figures whether they be fictional or real life, so choose those illustrations carefully. It doesn’t matter when it was created, so long as it was created purely in Procreate. Once the submission date is over, we’ll choose 5 Finalists and then you have a week for you and your friends to start voting! There are further guidelines on the competition's Facebook page, where you can also view the current entries. Yesterday we highlighted the new high resolution canvas options ﻿in both ArtRage and SketchBook Pro (4 and 3 megapixels, respectively), if you missed that article it might be helpful to read it first and come back here to follow the discussion. Because of the performance hit when painting with these new multi megapixel canvas options the doodler might find the standard resolution a more pleasant painting experience. However, if you plan on keeping your artwork and presenting it at the highest possible quality then surely the extra detail is worth the slowdown. If you were to present your ArtRage painting in print, at 1024 x 1024 you could just about get away with an image size that was no bigger that 12cm square. Go for the high resolution canvas and you can print up to 24cm square. That's enough data to allow your painting to be printed in a glossy magazine without the reader noticing the pixels. Certainly at that resolution large inkjet photo prints will surely shine. Most iPad artists might only ever display their paintings on the iPad screen, but that doesn't mean you should forego the megapixel canvas option. The next iPad is almost certainly going to come equipped with a Retina class display, that's 2048 x 1536 pixels. Any paintings created using the standard canvas options will look soft and perhaps even dull on a Retina class display, whereas multi megapixel paintings will fulfill the full potential of such a display. Of course, Procreate fans might just be able to have their cake and eat it. By enlisting the mindblowing power of the SGX graphics processor Procreate can run at speeds that ArtRage and SketchBook Pro can only dream of. The Procreate high resolution update can't come soon enough. Painting Credit: Shaun Mullen. A fellow Brit and one of the best iPad artists we know! No Mac apps, no gimmicks. Procreate is actually drawing at high definition resolution using OpenGL graphics acceleration. Just export to photos, and check out the 1920x1408px size! Coming soon as a free update. Savage have even provided a couple of HD painting examples. Check them out for yourself here and here. We've printed out an A3 sized full resolution poster of the painting seen in the video above, it looks gorgeous! Savage are really pushing back the boundaries, this new canvas size will make a huge difference to the final quality of printed paintings. GarageBand: Flying A summery tune made in GarageBand for iPad and video shot on an iPod Touch. Augmented reality, a natural fit for the iPad? An AR demonstration from Total Immersion using the new iPad 2. We Want: Shenmue for iPad We put forward the case for bringing the Dreamcast classic and much loved series Shenmue to the iPad and provide 4 good reasons why the iPad is the perfect platform. iPhoto for iPad, why we are sure that it's on its way and why it will be glorious The title says it all really, we've got some predictions for you. Procreate - A Quick Look at a New and Unique iPad Painting App We take a look at the brand new iPad painting app which is already beginning to gain traction amongst the 'Fingerpainter' community. You should definitely check this out if you are thinking of buying Procreate. Miniot Offers a Real Wood Smart-ish Cover Like we did for the original iPad, we will be keeping a close eye on the stand out cases and covers for iPad 2 and letting you know about the cool or unique ones we find, like this wooden version of the Smart Cover from Miniot. Probably the cutest iPad painting so far! 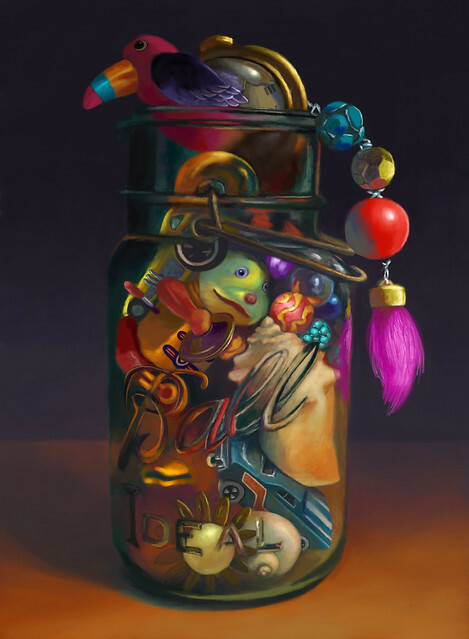 Using the aforementioned new app Procreate, one of our favourite iPad artists known as Olechka (Olga Shvartsur) has produced a very cute and very impressive image that we had to share. Probably the cutest iPad painting so far! We are huge fans of Olechka. Olga's iPad paintings have to be seen to be believed! Like any artist Olga knows how to get the best from the tools at hand. When painting with the iPad, 'tools' equals apps from the App Store. We have almost lost count of the amount of painting and illustration applications for the iPad, but amazingly each app has its own flavour, sometimes quite distinct from anything else available. This is certainly true of Procreate. Olga was quick to jump on Procreate, a deliciously smooth painting app from Savage Interactive that we previewed on Thursday, and just look at the results already! Olga makes it clear that 'Lilly' is a work in progress. Honestly, it's hard to see how it can be improved. Inspirational work as always Olga, thank you for sharing it with us. Further reading: Olechka's iPad Art. The final version can be found here. Savage Interactive (SI) are making big claims about their new iPad illustration and painting app Procreate. We take a quick look at what the app does differently and offer our first impressions of its performance. Artistic content creators have a whole raft of choices nowadays for the iPad but Procreate offers some unique features that the Developers believe will set it apart from these other apps, which is quite some claim given the following that apps like Brushes, SketchBook Pro, ArtStudio and ArtRage have already. Procreate might just be the most exciting digital painting app on a mobile device. We've taken desktop performance, added professional features and squeezed it all into an iPad. Blend colours on the iPad like never before. Procreate uses 64-bit colour sampling to mix paint together effortlessly, in a way that's familiar to traditional illustrators. The smudge tool has been finely tuned to react differently by adjusting the precision pressure slider-the more pressure you choose, the more colour will be pushed around. Users will feel at home with a familiar (HSB) colour picker, eyedropper, and a smudge tool that goes beyond its desktop counterparts. On top of all this, you'll find comfort in a layering system that allows up to 16 layers, the ability to merge down and up, transform, and show/hide. Another feature we're proud to boast about is up to 100 undo or redo states. That's right. 100. Let your imagination go, knowing there's always a backup plan. 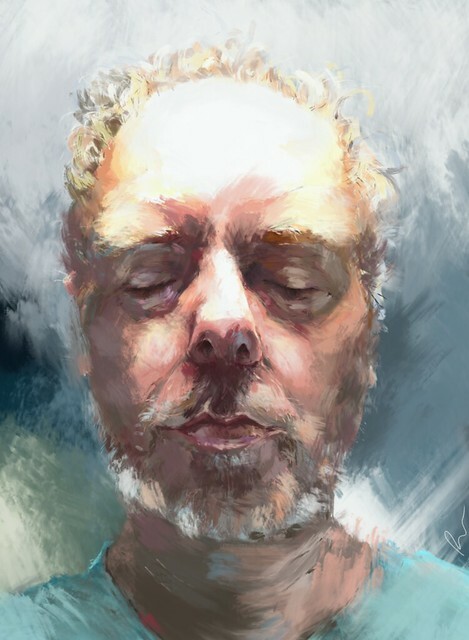 What really interested us about the Procreate app is that the small, four person, development team have created their own painting engine they call Silica. This is the secret to Procreate's amazing performance on the iPad. ...the result is Silica, the Si painting engine written completely in OpenGL ES 2.0. And because Silica is created entirely in OpenGL ES, the performance is just astounding. Procreate can paint and push around a huge amount of pixels at a constant 60fps. Thats better than most desktop painting apps. We have had a quick play with Procreate today and our first impressions are good. It is really very responsive, with little to none of the horrendous lag shown by some apps on the original iPad (yes Art Rage, we mean you). The 16 layers are useful and easy to work with, merging up or down frees up layers and everything works quickly so that you can see immediately the effect of adding, hiding or reordering your layers. Like the Paint tool, the Smudge tool is effective, infinitely variable and again very snappy. Procreate is probably one of the most responsive painting apps we have seen on the iPad. We still have the original iPad too. Creating your own brushes is where real depth to the app lies though, we think this is something that will provide some of the most creative possibilities, especially as you spend more time and experiment with Procreate. Brushes can be fine tuned to exact parameters, any image can be imported to define either the Shape or Grain of a brush, which when you think about it offers enormous creative potential. Another great feature is that a brush is shared between the three main tools once created, so you make a new brush under the Smudge tool for instance and see it immediately in the Eraser and Paint tools too, a seemingly obvious but previously missing feature from most iPad art apps. We have tried Procreate with a stylus and had no problems at all, in fact it seemed to work better than using our built in digits but that will always be a personal preference thing. We hope to try it out with the Nomad Brush as well soon and will let you know how that goes as soon as we can. Procreate is available now at an introductory price of $7.99 (£4.99) in the App Store but if you want to find out more about the numerous other features we haven't mentioned here, before buying, there is a lot of information on Savage Interactive's website including a nicely presented PDF user guide which we found really useful to get us going with the app.